"Friedrich Gulda belongs to the irrational sort, whose threatening extinction is a great loss to the world" (Manfred Gräter, WDR). After years of virtual abstinence from the classical music business Gulda cursed at its protagonists being 'scheißreaktionäre Künstlerlemuren' (reactionary monkeys) the lateral thinker returned to the concert stage in 1981. 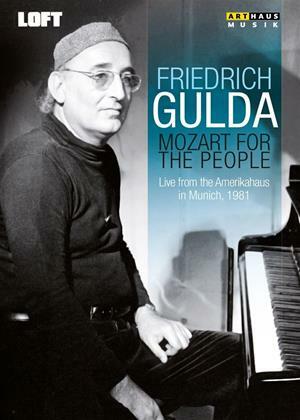 This recital from the Amerikahaus in Munich, which he combined with concerts in Milan and Paris, features Friedrich Gulda in a black sweatshirt, playing works by his personal favourite Mozart in a version especially for purists. Gulda presents his crystal-clear interpretations of the sonatas with his personally unique spirit and his indisputable virtuosity and musical tactfulness. His live-presence is, as always, a guarantor for a marvellous piano experience: a successful return of an "irrational" musical genius to his roots.